Nature has cures for all diseases. In “Cure the Incurable” the author suggests some successful alternative treatments of diseases written off by traditional medicine as incurable. Osteoporosis means calcium deficiency in the bones. According to conventional medicine, it is an incurable disease with a genetic component. Cancer emerges when the immune system is weakend. The suggested remedies are based on successful treatments of the disease by well know naturopaths of the world. A controversial theory on the origin of cancer is presented. Diabetes is frequently the result of a strong psychological stress. It usually happens to people with weak liver or with large intestine disorders. People with diabetes who don’t get insulin shots have a better chance against the disease. Therapies against many other ailments and afflictions. “Cure the Incurable” is Tombak’s second book in English language, following “Can We Live 150 Years?” The original (Polish) version of the book sold in over 1 million copies. Author Mikhail Tombak, Ph.D. graduated from the faculty of biology and chemistry of the Russian State University. For many years he was the head of Center for Health Sciences in Moscow; also the author of several bestsellers on the subject of health and healing. Suffering from many ailments, Mr. Tombak extensively studied Tibetan, Chinese and other Oriental alternative medicines, often experimenting on his own body, to become one of the world greatest authorities on health, longevity, and human body in general. The book offers hope and alternatives for those who are unhappy over the prospect of spending much of their lives in discomfort, relying on painkillers and other pharmaceuticals that usually cause side-effects, and sitting for hours in doctors' offices or lab waiting rooms. In too many cases, all such necessary sacrifice comes without any promise of real improvement or reversal of the disease, the best thing offered being a chance to deal with its symptoms and stop or slow down its progression. 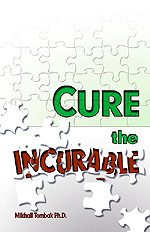 "Cure the Incurable" contains a great variety of options that can be tried without interfering with any ongoing medical treatment. In simple non-technical terms and from the holistic perspective, it explores the root causes of health deterioration, offers methods to deal with immediate symptoms, and shows the way to correct underlying problems. The degree of insight into health matters and the selection of healthy life style choices suggested in this book make it also a valuable read for those who still enjoy good health, as a way to prevent health problems or reverse them before they start manifesting themselves. There are many alternatives presented here, what allows our own intuition to come into play. We subconsciously know what's best for us. This is an important psychological factor, along with the hope for a complete cure. A great selection of holistically-based, both traditional and innovative methods originating from different cultures makes it possible to accommodate individual tastes and life circumstances. The readers can become authors of their own unique health-improvement programs by trying many suggestions from the book and choosing the ones that are best for them. Small changes introduced gradually can eventually build up to a whole new healthy life style, which is the most important thing in both preventing and reversing health problems. I think "Cure the Incurable" is a great follow-up to the author's previous book "Can We Live 150 Years?"